CINCINNATI April 23, 2018 -- ProAmpac, the fast-growing flexible packaging leader, today offers the latest innovations in the company’s flexible packaging products for the pet food industry. “From retort pouches and roll stock to quad-seal and woven polypropylene bags, ProAmpac has a ‘petfolio’ of products that deliver high-performance and value to the pet food market,” said Market Manager Julie Conklin, at the April 23-25 Petfood Forum 2018 in the Kansas City Convention Center. QUADFLEX™ (3-40 lb. capacity), premium pet food solution for dry food, treats and more, providing seals on four sides, with exceptional shape, strength and shelf presence. It has options for a flat bottom, pinch bottom, fold-over bottom; HD Flexo printing, with a soft matte, matte and gloss finishes; and easy-open and re-close options. NO.2 POUCH®, a PRO-POUCH product made of recyclable HDPE (3 oz.+), qualified to SPI number 2 classification; approved for post-consumer recycling; clear or white opaque; three side seal options; flat or stand-up with bottom gusset; reclose zipper options. “We are paying close attention to trends,” Grose continued. 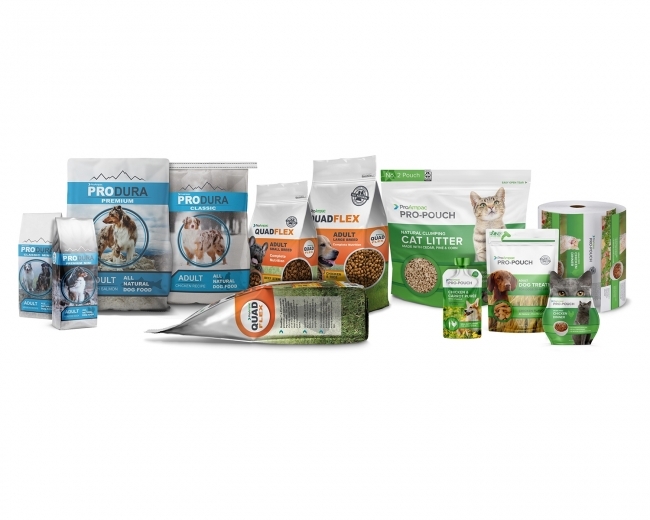 “We are meeting rising consumer demand for smaller packages; preferences for premium and super-premium pet food and the packaging that goes along with this; the Millennial Generation’s affinity for pet ownership—76 percent of them— expressing a ‘pets over people’ attitude; as well as the march for e-commerce purchasing which creates demand for lighter, stronger packaging that minimizes material usage.